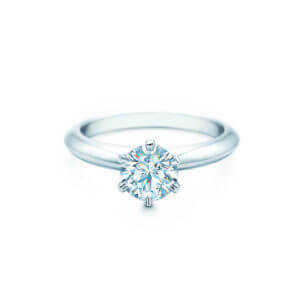 For example, if you wanted to get something similar to a classic Tiffany solitaire setting, Blue Nile offers a “Nouveau Knife Edge Six Prong Solitaire” that is extremely similar. Match that with any Excellent Cut eye clean GIA certified stone with a J color or better (something like this), and you’ll have a ring that nobody would be able to tell wasn’t Tiffany, yet it would cost half as much. If you prefer a more personalized approach, don’t hesitate to contact us and we’ll be happy to help you. Tiffany & Co. was founded in New York city in 1837 as a stationery and “fancy goods” store. In 1853, the company was taken over by partner Charles Tiffany, and they began to focus on jewelry. The company has been a major force shaping American culture in general. Aside from probably being the most famous jewelry store in the world, they also designed the Lombardi trophy (awarded to the winner of the Super Bowl), the MLS championship trophy, and a number of World Series rings over the years. The original “NY” logo for the New York Yankees was designed by Tiffany designers. They also designed one version of the Medal of Honor for the Navy during WWI. Lady Bird Johnson commission Tiffany to create their presidential china set for the White House. During the Civil War, Tiffany actually supplied the Union Army with swords, medical equipment, and flags. And finally, Tiffany even helped redesign the Great Seal of the United States of America in 1885. Probably the most well known piece of the storied history of Tiffany & Co. is the well known 60s movie, Breakfast at Tiffany’s starring the iconic Audrey Hepburn. Tiffany & Co. truly is a storied part of American History. If you’ve read most other articles on this site (especially my article discussing the evolution of the online jeweler), you probably know already that I feel that the classic model of the Bricks & Mortar jewelry store is a dying one—at least as far as the engagement ring business is concerned. I believe there will always be a place for bricks & mortar jewelry stores, but they will, over time, leave the engagement ring business as they will eventually concede that they cannot compete. The advantages that online diamond stores have over local physical operations fade away once the online store has to carry an inventory (which is the case with fashion jewelry but not with loose diamonds). I begin with this preface because I believe that Tiffany & Co. will be the last to succumb to this death. They are the best of the best in the world of Bricks & Mortar jewelers. Their brand cache (to speak nothing of their simple brand recognition) is priceless. Their icons are so ubiquitous, they even have their own trademarked color—Tiffany Blue. Can you think of any other gift item where it probably matters more to the recipient what’s on the outside of the box than what’s in it? This brand cache was built over a century and a half of more than just clever marketing—it was built through a single-minded dedication to their mission to be the classiest jewelry and high-end gifts store in the world. Tiffany’s most iconic style is their classic solitaire setting (pictured on the left). It is so iconic, Tiffany calls it simply “The Tiffany Setting” in their catalog. It is elegant simplicity at its finest. But the truth it is virtually indistinguishable from options that are available elsewhere, such as this gorgeous setting from Blue Nile. It’s one of only a handful of stores in New York City that is in and of itself a destination just to see. It’s so well known, most people who have never set foot in the store are probably familiar at least with the first floor layout. On a short trip to New York City, I decided I wanted to test Tiffany on two accounts. Firstly, I wanted to see if the famed Tiffany & Co. experience was what I would have expected it to be. Would I feel I was buying just any other product, or would I feel as if I was going through a true luxury buying experience? Would their salespeople be knowledgeable? Friendly? Pushy? Easy going? Would it be easy to return, or would I be given a difficult time? Secondly, knowing Tiffany would be more expensive than buying online, I wanted to see by just how much. I wanted to put the best I could find online up against the best Tiffany had to offer (in terms of value, at least). To accomplish both of these goals, I entered the famed Tiffany & Co. location at 5th Avenue and 57th Street in Manhattan (The very same location featured in Breakfast at Tiffany’s) as a guy about to propose. I sat with a salesman for a little while discussing different options. I then purchased a ring and took it to a professional jewelry photographer along with a ring I ordered from JamesAllen.com to be able to compare them side by side. For the purposes of this exercise, I decided to focus on the Tiffany Novo style which has exploded in popularity along with Cushion Cuts in general. 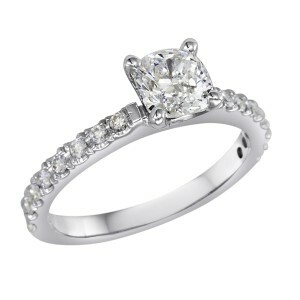 The Tiffany Novo is basically a very well made cushion cut set in a simple platinum band with pave stones on the shank. We are comparing it to this Art Nouveau pave setting from James Allen. My original goal was to compare the best value one carat cushion I could find on James Allen (set in their setting that is similar to the Novo) with the cheapest 1ct Novo I could find at Tiffany. Unfortunately, I had to make a last minute shift in my strategy as the cheapest 1ct Novo they had in stock was over $22,000—above the $18,000 I had prepared for this review. So on the spot, I altered my strategy to test dollars spent against dollars spent instead of size against size. It’s not surprising that the packaging from Tiffany was the nicest I had ever seen to date. This is a critical part of their branding mix (if not the critical part). After the purchase was finalized, my sales associate brought out the elegant black ring box. He the wrapped the ring box in folded tissue wrapping paper, and then slid the wrapped box into the famous “little blue box.” He then ritually wrapped and tied the little blue box with elegant white ribbon. It was clear that he went through serious training to perform this ritual to perfection. 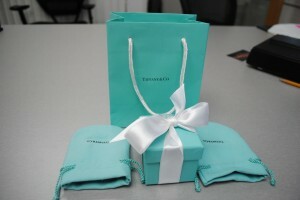 The “little blue box” was then placed inside a Tiffany Blue tote bag. Along with the ring box, he placed an envelope containing a copy of Tiffany’s in-house certificate and two signature Tiffany jewelry pouches. 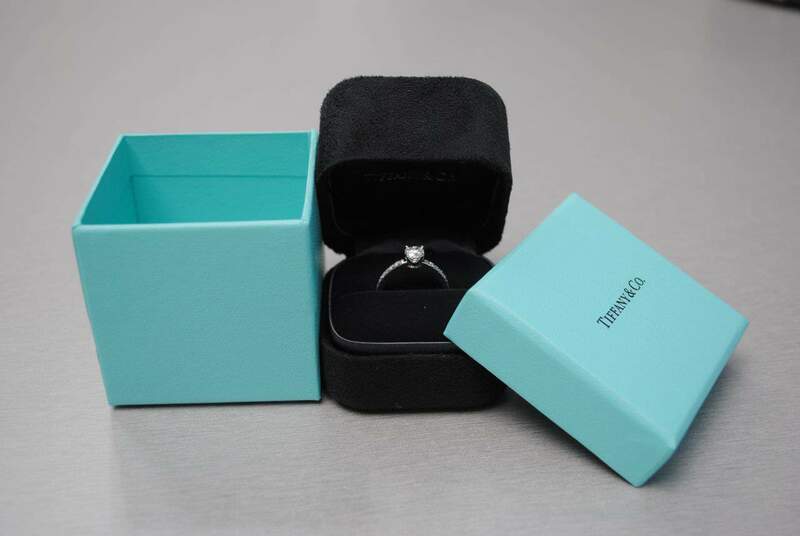 Perhaps the only two surprises regarding the packaging would be the generic nature of the actual black ring box itself and the fact that Tiffany’s diamonds are not certified by an external lab. The plain ring box, while elegant, could have been taken from any other of a thousand jewelry stores. It pales in comparison to the James Allen ring box. I would have expected a bit more—but like I said earlier, the “little blue box” is what’s more important with Tiffany purchases, not what’s inside. 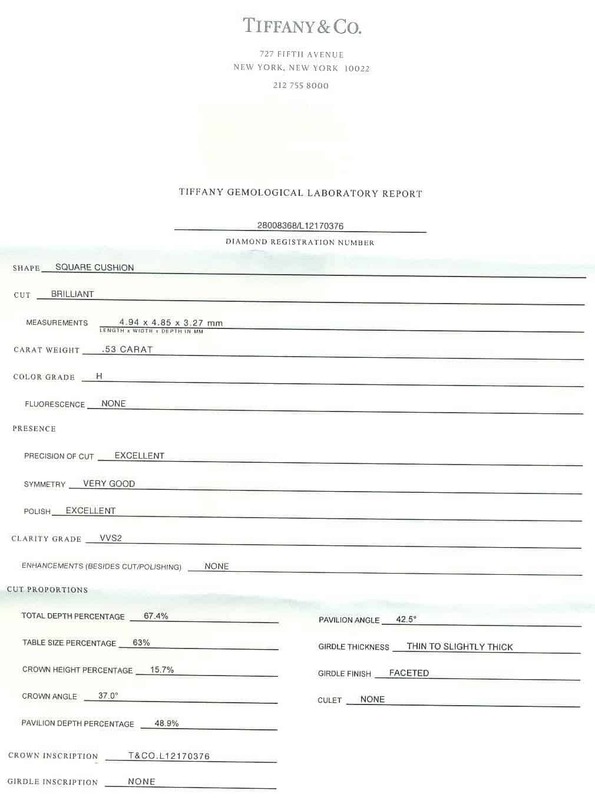 As for the non-independently certified diamond, while it’s true that they guarantee their grades against any 3rd part lab, not many people will actually bother sending their rings to GIA (which they can’t anyway, because GIA won’t certify a mounted stone). However, in all fairness to Tiffany & Co., I found that their in-house grading was spot-on (at least in my case). Tiffany is an oasis of calm, class, luxury, and style amidst the bustling city just outside the doors. Everything about the store, from the decor to the dress of the associates and the music playing in the background bolsters these feelings. Engagement rings and bridal jewelry are on the 2nd floor which you get to from elevators in the back of the store. Each elevator is staffed by an elevator operator who greets you with a warm smile as he asks you where you’re headed. When you leave, he warmly wishes you a great day and thanks you for visiting. Once I made it to the 2nd floor and was connected with a sales associate, things went very soothly. The only anomaly that caught my eye was that he continually referred to VVS clarity as “medium” quality and VS clarity as “lower” quality. Clearly, if you’ve read other articles on my site, you know that this goes directly against what I believe. To call a VVS “medium” quality is absurd. The only other issue I would take was that their selection was quite poor. As I mentioned earlier, I wanted to buy a 1ct stone, hoping for a G/H VS (they don’t sell SI clarity) that I could buy for under $18,000. But unfortunately, the cheapest 1 carat Novo they had in stock was over $22,000. I believe it was an E VVS2. He called another store in New York that thought that they might have a 1.15ct I VS2 in stock for about $16,000, but in the end it turned out to be on hold for another customer. To contrast, here is a current list of 1.10-1.19ct cushion cuts you can find at James Allen. My associate even mentioned that in their NY stores, the “lower” quality one carat stones were extremely popular. He said they sell out almost immediately as soon as they arrive in the stores. After it became clear that I couldn’t afford a one carat Novo for this review, I had to quickly adjust my expectations. Tiffany doesn’t carry any 3/4ct Novo rings for some reason (perhaps that’s their policy across all styles—I don’t know), so I had to go down to a 1/2ct stone. This worked out well in the end, however, as the price for the half carat ring ended up being relatively close to the price I paid for the 1 carat cushion cut ring from James Allen. The price for the Novo from Tiffany & Co was $6,300 before tax and $6,859 including NY state sales tax. You might think it wouldn’t be fair to compare the after-tax price to what I paid from James Allen, but the truth is it most definitely is fair. With online diamond sellers (at least until the law changes, if it ever does), you can avoid state sales tax by having the ring sent to a state where the store doesn’t have a presence. 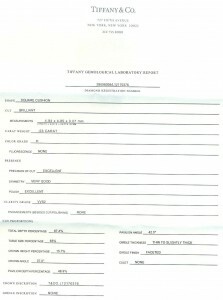 James Allen, for example, only has a physical business presence in New York and Maryland. So any other state is Tax Free. Even if you live in New York or Maryland, you can easily have the package shipped to the nearest FedEx location just over the state border marked “Hold at Facility” where you can go pick it up tax free. This isn’t possible with a store like Tiffany because even if they would agree to mail it to you to a different state, it most likely wouldn’t matter because Tiffany has stores in many states (and certainly the most populous ones). The ring I ordered from James Allen was made up of a 1.00ct H color SI1 clarity square cushion cut (click to see the diamond’s original page on James Allen) and the 18k White Gold 2.0mm Art-Nouveau Pave Set Diamond Engagement Ring. Please don’t take our comparisons here as recommendations for what you should buy (though that is a great looking diamond). We are just trying to find similar diamonds so we compare apples to apples. If you are looking for help buying an engagement, contact us and we will make personal recommendations for you. As with just about all of the other online diamond stores, this ring was created to offer an alternative to the very popular Tiffany Novo. The rings are similar enough that they offer a great value as an alternative, but different enough that there are no trademark infringements. The diamond that I chose from James Allen cost $3,330 and the setting cost $1,150. To be fair, this setting was 18K White Gold. The same ring in Platinum (to compare correctly to the original Novo) would have cost $1,650. So all together, this ring in platinum would have cost $4980. So to review, I was able to buy a full one carat ideal cut cushion cut from James Allen set in a very similar setting to the original Novo for just under $5000. At Tiffany & Co., I was only able to get a 0.53ct cushion cut for $6859 out-the-door. I was curious how much their cheapest one carat would have cost me, so I just called their national customer support line and was told the cheapest possible one carat Novo I could buy would be a 1.00ct (1.16ct total weight including the side stones) I color VS2 clarity for $13,700. Considering that the H SI1 I bought from James Allen was completely eye clean, the upgrade to a VS2 at Tiffany would have been a complete waste. Which basically means that the diamond I purchased from James Allen is a visually better diamond than the I VS2 from Tiffany. Because eye clean will always look the same as eye clean, no matter what the actual clarity grades are—but color is always visually relative. Yet, the one carat ring from Tiffany would have cost almost $9,000 more than the ring from James Allen. Including New York state sales tax in the calculation, the one carat Tiffany Novo would have been a full three times more than the James Allen ring! That was Colorless, What About Fancy Color? 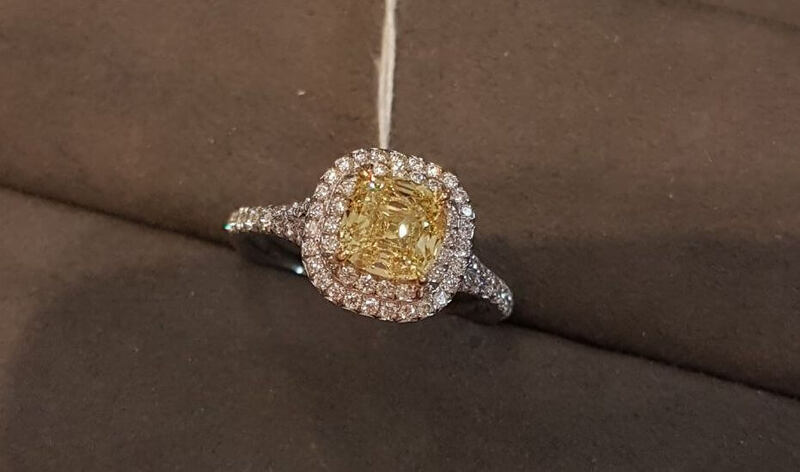 We again stopped by the flagship store to see how their fancy color offerings compare with Leibish & Co.
We were shown this 1.33ct Fancy Intense Yellow cushion VS1 clarity double halo ring by a very competent, knowledgeable, and helpful sales professional named Victor Lu. Compare that with this diamond from Leibish. It’s a nearly identical 1.30ct FIY VS1 Cushion cut. Yet at Leibish this stone costs only $10,500. Add that stone to this double halo setting, and you’ll wind up with a virtually identical ring for $13,450. That’s a difference in price of $18,050 (plus tax)!! While I would certainly agree that the “Tiffany experience” is second to none, I cannot justify spending triple the amount needed to get a similar sized diamond (and ring) at a quality online diamond store like James Allen or Brian Gavin. As always, you are welcome to contact us and we will answer any questions you may have. 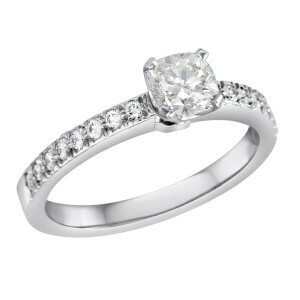 We are happy to guide you to the perfect diamond ring and help you get the best bang for your buck. You can spend almost $15,000 for a one carat Novo, or you can spend under $5000 for a nearly identical ring (even better color). The “Little Blue Box” and the warm fuzzy feelings of Holly Golightly are nice, but I’m not sure they’re worth Ten Grand. Diamonds are Forever—blue cardboard boxes and buying experiences fade with time.